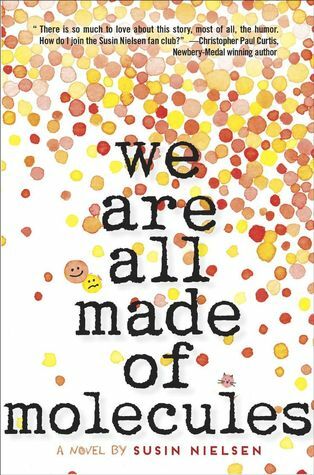 Last week I read the novel We Are All Made of Molecules by Susin Nielson, a Red Maple nomination (the Red Maple Award reading programme is offered for the enjoyment of children in grades 7 and 8). The story centres around 13 year old Stewart who is academically brilliant but socially clueless, and 14 year old Ashley who is popular at school but academically weak. Their worlds collide when their parents move in together and they need to learn to live as a family. “I don’t like to talk a lot about the year that she was sick. Or the year after she died. My dad is also quality and he did his best, and I like to think that I am quality and so I did my best, too. But it was really hard because we were missing one-third of our family. We had been like an equilateral triangle. I enjoyed this novel from its first pages. It was humorous, well-written, and spoke of an experience that many grade 7 and 8 students go through at school. The pages touch on blended families as well as the struggles that those just entering their teens experience. I would recommend this book for any teenager who is looking for a read that will keep them interested. The novel is also the perfect read for any adult who would enjoy reading an experience from the viewpoint of a child entering adolesence and a blended family. It was and I recommend it with no reservation. Yours sounds interesting as well. Definitely relevant to teen readers today. It was a good read. I loved it! Some serious topics this week. True – I have read quite a few serious ones too. Sounds like yours is one for the older teens. I don’t read much YA but this sounds like a story I’d enjoy. I like the writing in your Teaser a lot. I think you would. As I read it, I thought that adults may like the storyline as well.